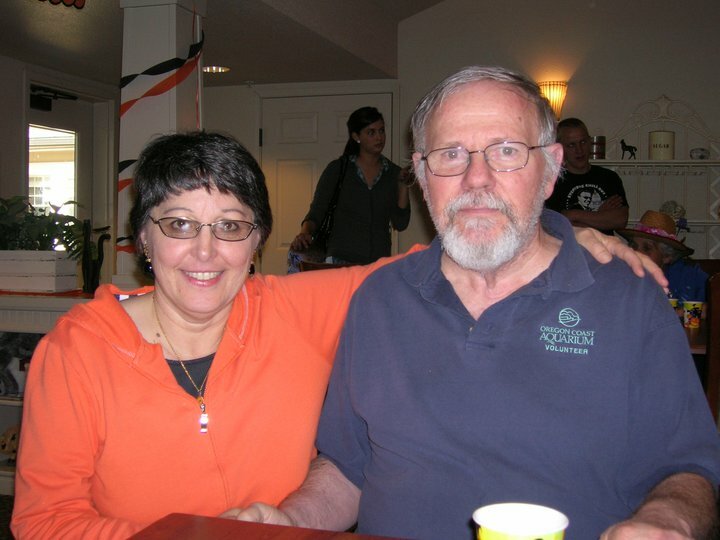 A few days ago, Facebook showed me a photo from 2010 of me and my late husband Fred at a Halloween party at the Timberwood Court memory care facility where he lived most of the last two years of his life. He looks disoriented. I look weary, and my glasses are askew. I wore an orange hoodie, the same one I wore this Halloween, and I can see orange and black decorations in the background. I remember bowls of candy, somebody’s kids in costumes, and “The Monster Mash” playing in the background. The merriment was forced. Most of the residents had no clue what was happening. After we said goodbye, I drove home through Corvallis. The trees were so brilliant with fall colors that I had to stop and take pictures. I walked the promenade along the Willamette River among kids in costume, couples strolling, and bicyclists speeding by. Mostly I stared at the river. It was always difficult to come out into the world after a visit to Fred, especially on holidays, which he used to enjoy so much. I didn’t know this would be his last Halloween, but I did know Halloweens were not the same anymore. My mind goes back to 1997. Halloween occurred just a few days after Fred’s father died suddenly of a stroke. Perhaps it was unseemly, but we decided to go ahead with Halloween at Fred’s mother’s house in Newport. Fred’s brother and his wife were there, and we brought our dog Sadie. Mom Lick had a cold and stayed in the back room while we “kids” took turns handing out candy. In that neighborhood behind the Fred Meyer store, folks block off the streets every year and hundreds of trick-or-treaters come seeking candy. That year, they came in such a steady stream that we never really got to close the door. One of us had to hold the dog to keep her from bolting outside while the other tossed mini tootsie rolls in their bags or plastic pumpkins. It was cold and windy, but it was fun. Fred talked to all the kids, praising their costumes. Friends who knew my father-in-law had just died seemed surprised to find us doing the Halloween thing, but Mom insisted. She hung up her spooky stuffed monkeys in the window, set out her pumpkins, and we did Halloween as usual. We continued the tradition for another four years, until she too passed away. It was a nice change from Halloween here in the woods where it’s so dark and spooky nobody ever comes trick-or-treating. I hang up orange lights, light a candle in a pumpkin and buy candy just in case, but always wind up eating it myself. I just finished last year’s bag of little Hershey bars. Now I have Tootsie Pops. You know what? They still taste great, especially when you get to the chocolate in the middle. Our weather usually changes to winter in October. This Halloween, just before dark, it started raining like a hurricane, coming down so hard it looked like the ocean was coming to get us. I imagined the scene at many homes where the kids were set on going out and the parents were just as set on staying dry. Downtown was set up for the usual Deco District festivities where merchants hand out candy, but I didn’t see a single kid there. In Mom’s old neighborhood, over a hundred souls braved the storm. You’ve got to be tough growing up on the Oregon coast. Growing up in San Jose, my brother and I did the typical Halloween thing. I remember smelly plastic masks, scratchy store-bought costumes and embarrassing homemade ones. I remember going door to door with our Halloween bags while Mom or Dad watched from the sidewalk, making sure we said “thank you” at every stop. As we collected Three Musketeers bars, Life-Savers, suckers, candy corn and other wonders, we never worried about the weather or had to cover our costumes with raincoats, gloves and hats. We also never worried about running into bears or cougars in the dark. Different worlds. This Halloween, I sang at the 5:30 Mass, ate a late dinner and watched three episodes of “Gilmore Girls” on DVD. In the glow of my orange Halloween lights, Annie snored in the big chair and I contentedly sucked on a chocolate Tootsie Pop. I hope your Halloween was good. Now it’s time to brace ourselves. It’s standard time, and winter is here. Will it be a trick or a treat? Wait and see.